Well, it's Friday and that is a very good thing! I am in a particularly good mood because just last night I got my copy of the March/April issue of Paper Crafts magazine in the mail and it just so happens that if you turn to page 63 you will see MY CARD!!!!! I'm pretty darned excited, to say the least. There may have been ridiculous amounts of squealing and jumping around going on when I opened it. Just say'n. This is the first time I've been published in Paper Crafts and only the second time I've been published ever and the last time was many many years ago...in a Making Memories publication (back when they were still a magazine!) called Card Making for Scrapbookers. I am SO excited about this! I can't even tell you! It's crazy. For reals. Just say'n. 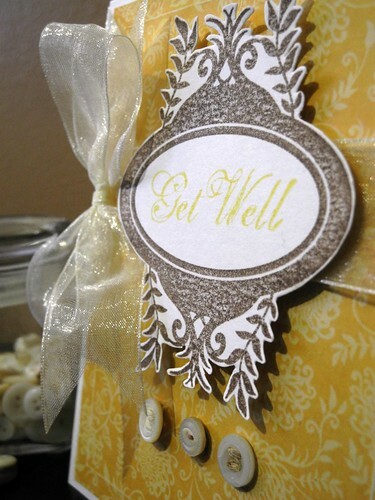 BUT...today, I have a pretty Get Well card to share with you for Friends With Flair Friday! I used the beautiful Encompassed Grace stamp set by Samantha Walker along with Samantha's paper collection from Creative Imaginations. That gorgeous ribbon is a sheer from May Arts and I simply added a few vintage buttons to finish off the card. The Hubbums asked me to create a get well card for a friend who broke her leg recently and since I didn't have the broken bone stamps on hand that he requested (lol!) I decided to go with a pretty look. And ever since...I've been thinking I need to find a cute set of broken bone stamps! HA! Of course, that might be bad because I might start wishing for someone to break something so I can use them. Yeah....probably not a good idea. I'll stick to pretty Get Well cards! HA! I hope you have a super stupendous Friday! Come back tomorrow for the Stampendous! blog hop - we have a really cool new product to show off! And ... come back on Sunday for a special day! Congrats on your publication!!! And super pretty card, too. You SHOULD be excited! That card is a work of art - love the feather & the neat vintage doily piece! I love the pretty Get Well card...although I'm intrigued by the funny kind too. I think maybe Hambo has some silly/funny ones? CONGRATULATIONS!!!! Happy dancing on your behalf over here! And the card? While I think a broken bones stamp would be way cool, I think your beautiful card is going to soothe the recipient as well as please her! Not only is the stamp you used to frame the words lovely, but that ribbon is a really elegant addition! congrats jennifer! your work is awesome! Congrats, Jennifer!! So Happy for you!! This card is really sweet, you always make such gorgeous creations with SW's stamps. Beautiful card! and congratulations on getting published. I just received my copy yesterday, but hadn't opened it ....just grabbed it out of my bag - gorgeous! Many congrats on the pub!! I saw your card in the magazine...it is beautiful...congratulations. And this card today is just as gorgeous. love the design of the card and the paper choice is perfect!!! Lovely!!! wow this is gorgeous...Love that amazing stamp and how you added the buttons...great card. And congrats on the pub. Have you shared the card on your blog yet? Congrats on being published. Your card is so elegant, love it! Gorgeous card. I love the colour scheme on this card. Congratulations on getting published. So happy for you! you deserve this!!! As always, your card is divine! WOOHOO congrats! the colors of this card are amazing! CONGRATS!!! I just opened up my issue and found your card, so pretty! This card is beautiful as well, love that ornate frame! Congratulations! And that is another fabulous card. Well, so deserving! Your card is simple, but awesome. I'm tickled for you! When I was published, I probably squealed just about as much as you did! It's like your 15 minutes, right! Congrats- I love seeing familiar names in my issues. I'm going to go look for your card right now! 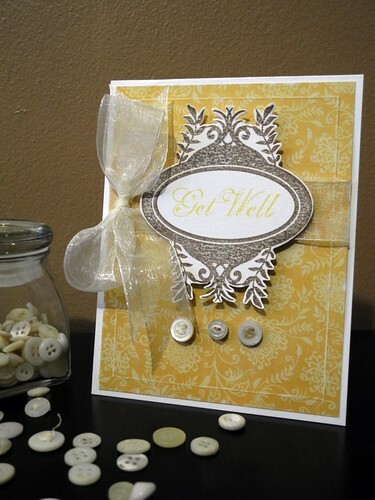 Such a beautiful elegant get well card. Love it. How do you get the bow to tie sideways. Do you put the horizontal ribbon on first and then glue dot on the tied bow separately? Enquiring minds want to know cuz your is perfect! congrats on being published... your card so pretty. Congratulations Jingle! I can think of anyone who deserves it more! This card is beautiful. The one published is beautiful. And congratulations on good news today for you too! Congrats on being published!Your card today is beautiful! Congrats, Jingle! Love all the fussy cutting on this one! Such a wonderful combination of elements. A truly beautiful Get Well Card! Congrats, Jennifer! Your card is awesome and I'm happy you got more happy mail from PC today! CONGRATS I am soooo happy for you!!! This is so pretty! I love the ribbon and buttons! Congratulations! You certainly deserve it as you are most awesome and you make the greatest creations! Congrats!!! I don't know about broken bones, but I wish I coyld break something to get this beautiful card!